Membership has its benefits! Financial Partners Federal Credit Union members have access to all the financial products, services and conveniences our credit union has to offer. If you live, work, worship, or regularly do business in the ten townships of East Allen County, or have family that qualifies, you are eligible for membership. These townships are Cedar Creek, Springfield, Scipio, Milan, Maumee, Jefferson, Jackson, Marion, Madison, and Monroe. Because we are dedicated to providing credit union services to as many people as possible, we extend membership to the families of those within our area as well, regardless of where they may live. You can apply for membership at either of our convenient offices where our staff will help you find account options that fit your needs. You will need two forms of identification (driver's license, birth certificate, social security card, etc.) as well as proof of your current address, if it is not listed on your ID. Under certain circumstances, we may require further identification, so please come prepared. We look forward to serving you. 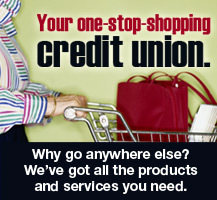 Contact us for more information on joining the credit union. Financial Partners and its affiliates will never initiate a call asking you to confirm any personal information. Please be cautious and never give your account number and/or card number to someone you do not know. If you do receive a call asking you to verify any information, such as your address, your PIN, or security codes, do not confirm this information. Contact us directly for verification of any requested information.